Spicy Country Cheese Bread, not only smells delicious, but there’s just enough of a spicy kick to send your senses into a frenzy! With a surprise cheesy center inside every slice, you have your new sandwich or snack bread. If you love homemade bread, don’t miss my Artisan Apple Bread, Beer Bread, or Homemade Easy Dinner Rolls. Every now and then, I like to spice things up and make up a batch of this spicy cheesy bread. I always go into it thinking that it will last a few days but the novelty of this bread makes it fly off the table. This bread is seriously gorgeous and tastes delicious. You can serve it up as a snack bread or as a dipping bread for any kind of saucy dish. I love t serve this with Chicken Stroganoff or Tomato Chicken Spinach Spaghetti. You could also just grab a bowl of marinara and dunk away! It is amazing all on its own. Mix your dry ingredients together in the bowl of a stand mixer (flour, sugar, yeast, pepper flakes, and salt). In a separate medium bowl, whisk together the water, eggs, yolk, and butter. With your dough hook attached, turn the mixer onto medium speed and pour the wet ingredients into the dry ingredients. Let the mixer knead until the dough no longer sticks to the side or bottom of the bowl, typically this takes about 10 minutes. Remove the dough from the mixer and form a smooth ball. Place the dough ball into a large, greased bowl. Cover loosely with plastic wrap and let sit in a warm place for 1 1/2 to 2 hours, until it has doubled in size. Roll the dough into a 12×18-inch rectangle (if the dough is sticky, generously flour the surface first). Evenly sprinkle the cheeses over the dough, leaving a 1-inch border untouched. Tightly roll the dough into a log. Place the log seam-side down and roll it into a spiral. Tuck the end of the spiral under the loaf. Transfer to a greased 9-inch round cake pan. Cover loosely with plastic wrap and let it sit in a warm place for 1 1/2 to 2 hours, until doubled in size. About 20 minutes before the second rise is through, place oven rack to the lowest position and preheat the oven to 350°F. Brush on the egg wash and sprinkle on the red pepper flakes to your liking. Rotate and tent loosely with foil and continue baking for an additional 25 minutes. Allow the bread to cool in the pan until it is warm enough to handle. 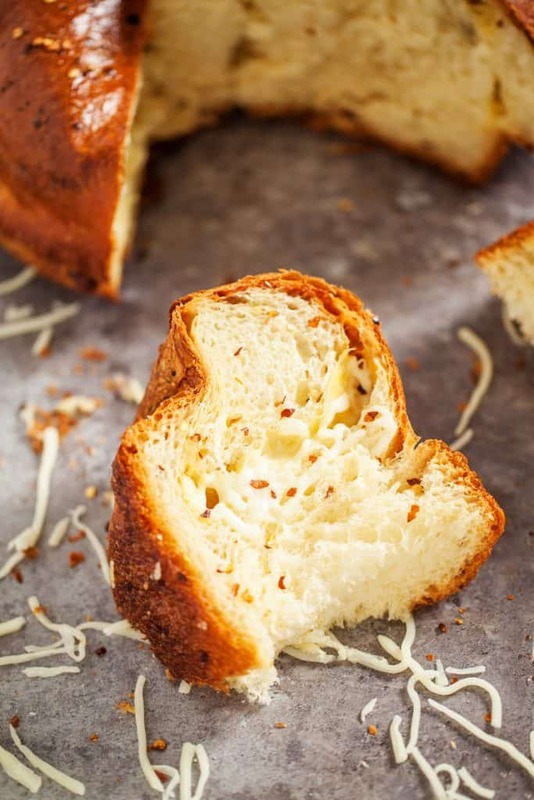 What do you Serve with Country Cheese Bread? 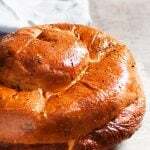 While this amazing bread could be a meal in itself, we love to serve this with casseroles, such as Hamburger Casserole, Tater Tot Hotdish, Tuna Casserole, Amish Chicken Casserole, and my favorite Corn Chicken Casserole. If you happen to want fewer carbs in your dinner, these salads would be perfect! Nothing beats the aroma of fresh, homemade bread. 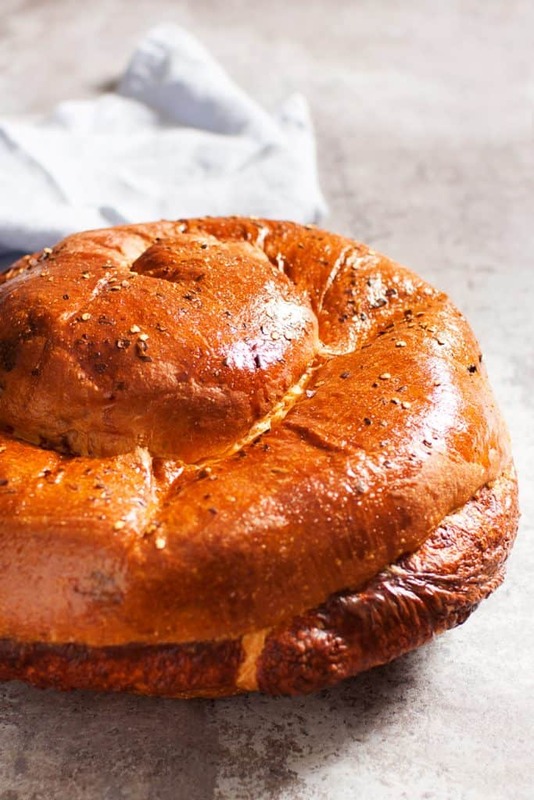 With this Spicy Country Cheese Bread, not only does it smell delicious, but there's just enough of a spicy kick to send your senses into a frenzy! In the bowl of a stand mixer, add the flour, sugar, yeast, pepper flakes, and salt. Whisk to combine and fit onto the mixer with the dough hook. In a medium bowl, whisk together the water, eggs, yolk, and butter. On medium speed, pour the liquid into the flour mixture and let knead until the dough no longer sticks to the side or bottom of the bowl, about 10 minutes. Remove the dough and form into a smooth ball. Place in a large, greased bowl. Cover loosely with plastic wrap and let sit in a warm place for 1 1/2 to 2 hours, until doubled in size. Turn onto the work surface and roll into a 12x18-inch rectangle (if the dough is sticky, generously flour the surface first). Evenly sprinkle the cheeses over the dough, leaving a 1-inch border untouched. Tightly roll the dough into a log. Place the log seamside down and roll into a spiral. Tuck the end of the spiral under the loaf. Transfer to a greased 9-inch round cake pan or Dutch Oven. Cover loosely with plastic wrap and let sit in a warm place for 1 1/2 to 2 hours, until doubled in size. About 20 minutes before the second rise is through, place oven rack to the lowest position and pre-heat oven to 350°F. To the risen dough, brush on the egg wash and sprinkle on the red pepper flakes to liking. Bake for 25 minutes. Rotate and tent loosely with foil. Continue baking for an additional 25 minutes. Allow to cool in the pan until warm enough to handle. Remove the loaf from the pan and transfer to a cooling rack to cool completely. Did you Make Spicy Cheese Bread? Adapted from My Mother’s Apron Strings. Photography by The PKP Way. The number of eggs in the recipe is confusing. You have one slightly beaten egg, 2 eggs and 1 yolk and finally one beaten egg for the egg wash.
For the dough it is 2 eggs and you add 1 yolk, just the yolk. The other eggs you beat together and you brush on top of dough before you place in oven. Can you substitute the Monterey Jack and Pepper Jack with any other cheeses? I substituted Mexican cheese and it’s amazing. Just wondering if this needs to refrigerated once it has cooled since it has cheese in it, I’ve never made bread with cheese baked in it before. Help. Although I have baked bread in the past I am not a “baker” and have run into a problem. I followed the recipe exactly. Double checked everything. I used eggs the container said were large but they looked more medium to me. Regardless I used 2 whole eggs and 1 yoke. It only took about 5 minutes of kneading for the bowl to be clean. It said roll into a smooth ball – no way possible. The dough is going to come out heavy. I am going through the first raising now. Has anyone else had this problem? Or, any hints on what I did wrong? Has anyone done this in a bread machine? My brother gave me some Smart Balance to use to make him bread, do you think it would work in this recipe? ?